What a woderful suggestion......good luck. My bad... I just emailed you back. Most of the newer places south in The Villages was bought from another city. Either Wildwood or Fruitland Park. So if you search the address and add either Wildwood or Fruitland Park at the end, instead of The Villages...you will have a better outcome. I'm not sure when that will change over to The Villages... Could be a few months depending on how they process that new information. 3. Scroll down your apps list til you find (and press) on the VillagesGPS. 4. Press the word "Storage" - that's under "Mobile data" and "Battery." 5. Press "Clear Cache" and that should solve the problem. 6. Hit the back arrow up top (next to the word Storage), press Storage again, and "Clear Data." You'll lose any data you've plugged in previously so only click the clear data as a last resort. But if you're only just installing this for the first time, you won't have anything in there anyway so it won't matter. BIG shout-out to the VillagesGPS folks. They thanked ME for MY patience. Lemme tell ya. If I was calling the phone company, or any utility, I'd still be on hold waiting for someone to pick up, in the time it took VGPS to acknowledge, address, correct, re-visit, recorrect, adjust, and resolve this. Marvelous service and that will go into my review on Google Play, once I've had a chance to actually use it in the Villages next week. We try our very best to make sure everyone is happy. 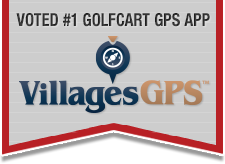 Our new technology can be a pain for us because it is custom for "Golf Cart Routes". We are Villagers too and just keep trying our best and won't rest until we get it right. As you can see on the Play Store and App Store, we don't have the best ratings... We have had our fair share of issues in the past but won't rest until we make it right. If you can say something nice, it sure would help us out. A NEW Update for Android Users is available now! It is Monday, February 25. You can follow these steps to see what version your app currently is. On the app, scroll down to “More Info” and click it. Then Scroll down to App Version and Click it. Search for Villages GPS on the Play Store and click Update. Thank you for your usual prompt response. Used the AP today and the sound is back. I really love this AP. I wish I had it 11 years ago when we first bought here. Highly recommend it. The price is right.